Bees reared in cities are healthier and more productive than their country cousins, a study by French beekeepers' association Unaf has found. Urban bees enjoy higher temperatures and a wider variety of plant life for pollination, while avoiding ill-effects of pesticides, the study said. At the same time they can filter out city pollution such as exhaust fumes. The study prompted Unaf to start a campaign promoting beekeeping in urban parks, on balconies and on roofs. Beekeepers say urban bees' productivity can be up to four times that of their rural counterparts. 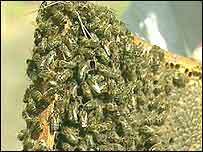 "In town, the bees go out more," apiarist Jean Paucton told AFP news agency. Another beekeeper said urban hives had maintained a steady mortality rate while in the countryside many bees were dying. "I would find great carpets of sick bees, all trembling," Loic Leray said. The Union of French Apiarists (Unaf) is campaigning against pesticides, which it says are destroying the industry. It has expressed particular concern about Gaucho and Regent, two banned chemicals, the effects of which are still felt in rural areas. "These molecules are neurotoxins which disorientate the bee and make it impossible for it to find the hive again," Unaf president Henri Clement told AFP. But others have blamed diversification for the decline, saying attempts by beekeepers to increase production by importing unadapted foreign varieties of bee have backfired. Correspondents say bees have a special place in French history - they were so admired by the Emperor Napoleon Bonaparte that he made the insect a symbol of his reign.